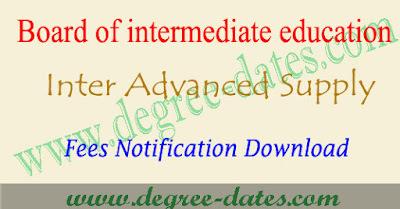 AP inter advanced supplementary fee last date 2017 AP inter supply fee last date 2017 1st 2nd year fees details:Board of intermediate education of Andhra Pradesh has been released due dates of AP inter supply fee last date 2017 ap intermediate supplementary fee date 2017,ap intermediate supplementary fee details 2017 ap inter supply fee last date 2017 and improvement fees details for 1st year and 2nd year students. 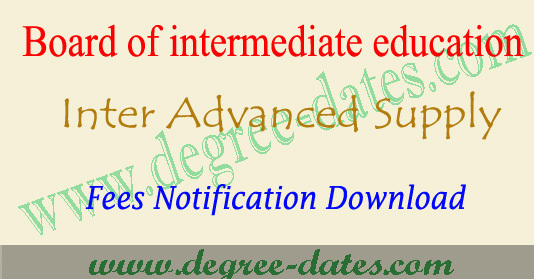 Here we provide AP inter advanced supplementary fee last date 2017,ap 1st year supply fees date,fee amount,ap intermediate supplementary fees details 2017,ap inter 2nd year fees notification in this regard complete information from the following article. The following are the rates and due dates for payment of examination fee for Advanced Supplementary Intermediate Public Examinations, May/June 2017 which are scheduled to be held from 15-05-2017 to 23-05-2017. Improvement for passed candidates: The candidates who passed in all first year papers can appear for Improvement on payment of Rs.120/- per paper in addition to the prescribed examination fee of Rs. 360/-. The candidates will appear with the same Reg(/. No. of LP.E March 2017. Failed candidates appearing for Passed papers: The first year failed candidates can appear for passed papers of first year along with failed (papers) subject to the condition that thev shall forego the previous performance of the passed papers. In such cases the latest performance stands valid. All such candidates have to pay Rs. 120/- for each passed paper appearing, in addition to the examination fee as shown in the ENRs. Necessary entries/corrections have to be made in the ENR and if required in the MNRs. The candidates who passed two year Intermediate course can improve their performance within two years. They can avail only two chances during this period. The passed candidates of IPASE May/June 2015 can appear for Improvement in LP.A.S.E May/June 2017 as a last chance if they did not avail two chances in the previous LP.Es. The Board of Intermediate Education has introduced the system to collect the Examination & other fee through State Bank of India and Andhra Bank through online transfer from the existing college Accounts to B.LE Account of the concerned banks through e-challan generated by the egg in the web site for First year candidates with effect from IPASE May/June 2017. The principals of the colleges, who do not have their accounts in the above two banks, are also informed to pay the fee through the generated challan provided in the BIE web site http:Llbieap.cgg.gov.in in anyone of the two banks. The Account Numbers of two banks are furnished here under for online transfer of the examination fee. Examination fee for General /Vocational Bridge course subjects. Submission of First Year and Second Year ENRs/MNRs of Additions and fee paid printout in the RIO office.